I made the decision to pursue competing on a whim. I saw other girls training for competitions & thought 'Why not put myself to the test?'. Although, I've never quite been overweight, I have been out of shape & unhealthy. As a college student I ate & drank what I wanted & as much love as I had for the health & fitness industry, my workouts weren't consistent and I had let my personal health slip. I had started to clean up my eating and get on a better workout schedule but I knew I wasn't giving it 100%. I thought that training to compete would give me a solid goal to work towards & that the commitment to a specific deadline would keep me on track and it did just that. 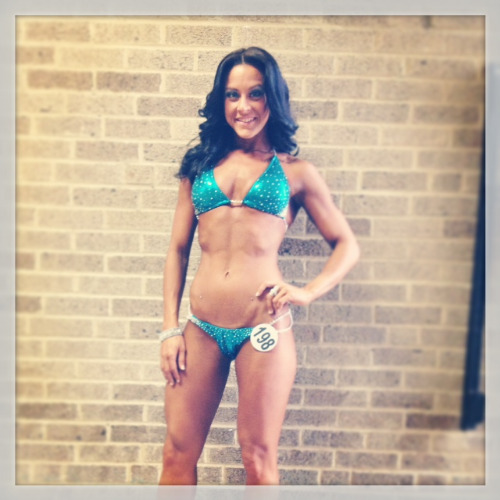 I began competition prep January 2013 for my show that would be in April 2013 - just 12 weeks to get ready for the stage. For 12 weeks I ate a well balanced clean diet consisting of lean proteins, complex carbs, vegetables and my favorite: peanut butter! I ate 6 meals a day, every day, eating every 2.5-3 hours. I had 1 "treat meal" a week where I allowed myself to eat whatever "bad" food I'd been craving that week. Throughout the duration of prep my diet didn't change a whole lot. I always mixed up what sources of proteins and veggies I was eating in order to keep myself from getting bored. As I got closer to the show I cut certain things from my meal plan such as the fruits in my breakfasts and changed the amounts and timing that I was eating my meals. My training routine was to wake up at 4:30 am every morning, complete 30 minutes of fasted cardio followed by 45-60 minutes of weight training. I was on a 5 day split where I trained a different muscle group each day. I started out lifting HEAVY -- that's right ladies, I was lifting heavy weights every time I trained & NO the myth that women lifting heavy weights will make them bulky is NOT true. Throughout prep my training plan changed in order to focus on target areas. For me this included changing the type of leg and arm routines I was doing in order to achieve the look I was going for. Fast forward 12 weeks, countless buckets of sweat, sore muscles and even some tears I was ready to hit the stage April 6,2013. I competed in my very first National Physique Committee (NPC) Bikini Competition and took home 2nd place in my class and a trophy bigger than me! Make the decision to try, commit to a goal and I promise you, if you put in the work, you WILL succeed.